"A half-hour out of Palm Springs the plane wanted to start a fire ... so yeah. Good old fire department, gotta love 'em." 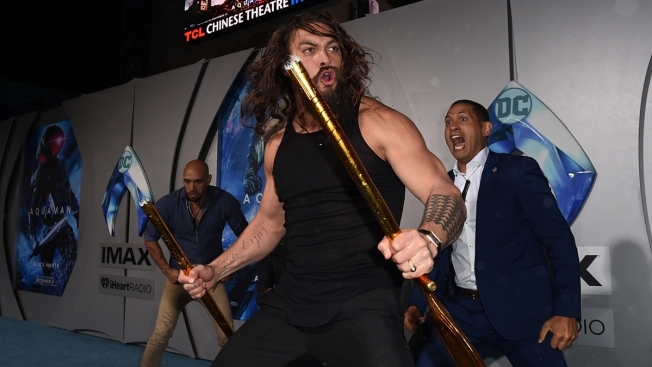 Jason Momoa leads a Haka dance at the premiere of Warner Bros. Pictures' "Aquaman" at TCL Chinese Theatre on Dec. 12, 2018 in Hollywood, California. A plane carrying "Aquaman" star Jason Momoa made an emergency landing Wednesday at Palm Springs International Airport. The Cessna Citation 560 XL was en route from Los Angeles to Phoenix when it made the unscheduled stop in Palm Springs due to a possible engine fire that turned out to be a false alarm. "Well we've got ourselves a slight delay," Momoa said on a video posting on his Instagram account. "A half-hour out of Palm Springs the plane wanted to start a fire ... so yeah. Good old fire department, gotta love 'em." Momoa posed for a photo with firefighter-engineer Andy Meza, which is featured on a Palm Springs firefighters' Instagram posting made just before noon about the "aircraft emergency." According to the post, Meza "told his crew, 'Not on my watch boys ... not on my watch."